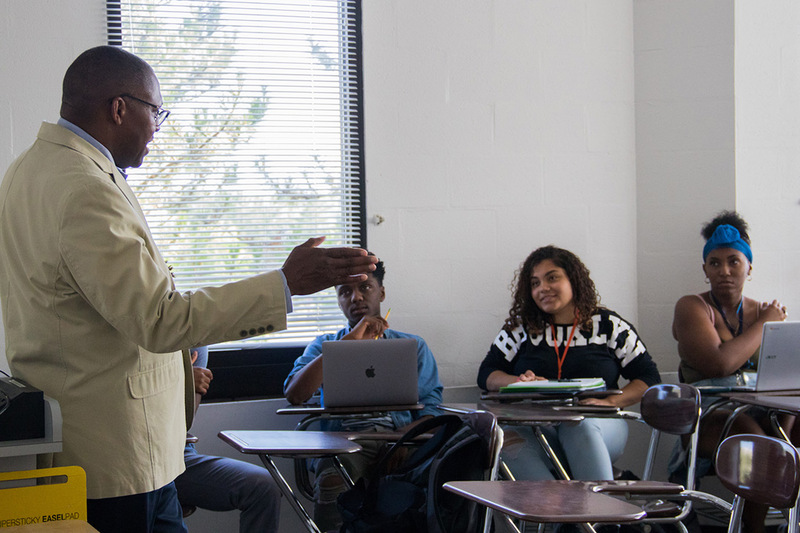 Several of the students participating in the Division of Diversity and Inclusion Summer Experience are taking an intercultural communication course taught by Keith Jenkins, RITâ€™s vice president and associate provost for Diversity and Inclusion. Sixty-four Rochester Institute of Technology freshmen are starting their college careers early by participating in the Division of Diversity and Inclusion (DDI) Summer Experience. The four-week program helps prepare first-year students from underrepresented populations for a successful transition to college. From July 14 to Aug. 10, the students live on campus and take two credit-bearing classes—a first-year writing seminar and a course in college algebra, pre-calculus or intercultural communication. The Summer Experience also provides the students workshops on study techniques from the Academic Support Center, connects them with mentors and deans’ delegates, allows them to explore regional landmarks such as Niagara Falls and engages them in community service projects. The DDI Summer Experience fused together summer bridge programs previously offered by RIT’s New York State Arthur O. Eve Higher Education Opportunity Program (HEOP) and the Multicultural Center for Academic Success (MCAS). A recent gift from a local charitable organization provided funding for the incoming class of Destler/Johnson Rochester City Scholars program to participate as well. The program also serves underrepresented students from across the country who aren’t affiliated with these scholarship programs. “The DDI Summer Experience has allowed the division to leverage resources and provide an enriching pre-college experience to incoming freshmen who have come to RIT through a wider range of pathways,” said Belinda Bryce, director of HEOP. Previous iterations of the DDI Summer Experience have proven to be effective in helping the long-term success of diverse students at RIT. In 2015, the first-year retention rate for students who participated in the MCAS Summer Bridge program was 92.5 percent; nationally at four-year private institutions that same year, the retention rate for African American students was 67.0 percent and 75.0 percent for Hispanic students. The DDI Summer Experience can also propel students who excel to scholarship and honors programs. The students will cap off the Summer Experience on Thursday with a community service project on campus and a closing banquet.